The widow of former B.C. MP Chuck Cadman says two Conservative Party officials offered her husband a million-dollar life insurance policy in exchange for his vote to bring down the Liberal government in May of 2005. The offer, which was summarily rejected by the dying man, is outlined in a biography of Mr. Cadman by Vancouver journalist Tom Zytaruk that is to be released on March 14. A copy of the manuscript, including an introduction by former Liberal prime minister Paul Martin, has been obtained by The Globe and Mail. "Chuck was really insulted," she said in a telephone interview with The Globe Wednesday. "He was quite mad about it, thinking they could bribe him with that." That's a kind of sponsorship, isn't it? How surprising to see the CPC putting a price on Canadian lives... Our soldiers are dying for much less now. Isn't Donna Cadman now the Conservative candidate in Surrey North? It seems surprising to me that she would go public with such an allegation since it obviously casts her party in a negative light? Yeah, that was mentioned in the Globe piece I linked to. Maybe there were other offers? i dont know, old brian was swept under the PR carpet pretty nicely. It was a hard decision to make, she said. "There was a few sleepless nights," Dona told the Now. "Running for a party, especially the Conservatives, you know it was a thorn in Chuck's side, so it was sort of a hard thing to decide but you need the party to back you if you want to do something, and running as an independent I wouldn't get that backing. "I need the party behind me to make any changes and they're going to be a majority government this time around, as far as I can see. Running as an independent is not going to give me the leverage that I need to make changes." Dona Cadman wants to "toughen" up the Youth Criminal Justice Act, and advocates stiffer sentencing and doing away with conditional sentencing for violent crimes. She also wants Chuck's street racing bill and VIN bill - which would make tampering with vehicle ID numbers a criminal offence punishable by up to five years in jail - passed in their pristine form. It's the lead story in the Post today. Dona Cadman, who is the Conservative candidate for Surrey North for the next federal election, could not be reached for comment Wednesday. Asked about the incident, former Conservative MP John Reynolds, who was leader of the opposition at the time, told Canwest News Service he did not wish to comment. "I'm not involved in politics anymore," said Mr. Reynolds. "I have no comment at all." A statement from the Prime Minister's office released Wednesday night said Mr. Harper "at no time directed any party official to make any kind of financial arrangement with Chuck Cadman." Ryan Sparrow, a Conservative party spokesman, refused to comment on the allegations, referring a reporter to the PMO statement. Meanwhile, Justice Minister Rob Nicholson said he's never heard anything about any buyout. "I've never even spoken with Chuck Cadman," he said. Other Conservatives gathered at a glitzy gala at Ottawa's Chateau Laurier hotel Wednesday night said they were completely unaware of the alleged offer. "This is coming totally out of left field," said one party official, speaking on condition of anonymity. Jay Hill, now the Conservative government whip and Opposition whip at the time of the vote in question, said he had never heard of the events. Mr. Hill shared a house with Mr. Cadman and two other MPs at the time. "If anybody had asked me, I would have said not to try to sway him any way except on principle. If you couldn't sway him on principle you couldn't sway him any other way." The only thing of recent memory that was worse than this abuse of power was when Paul Martin tried to bribe David Kilgour to stay with the Liberals by offering "stuff" for Darfur. Both of the 2 glorious political entities that have ruled Canada have lowered themselves and all politicians for continued acts. I am sure that these happen every year and have happened every year since confederation. Whether it is a bribe for a vote, a bribe to cross the floor to another party or a bribe to resign a seat to allow someone else to run. Stockwell Day and the Canadian Alliance paid former MP Jim Hart $50,000 to give up his seat. I guess the inflation rate must be higher on Parliament Hill. Hell Stuart Smith withdrew his name from the nomination in riding of Mount Royal to allow Pierre Trudeau to run for the 1965 nomination. His pay off came a number of years later when he was "given" the leadership of the Ontario Liberals. I think it's helpful to see how Canadian democracy really "works". Even better examples would be what happens to politicians that implement unpopular policies, perhaps in contradiction to their electoral promises, after they leave office. The paper trail of cash often disappears, as in the case of Mulroney and his nefarious activities, but these things are still very much worth investigating. Our entire system seems predicated on the ability of politicians to lie their faces off, ignore the public will (or even the will of their own party members sometimes), and get handsomely rewarded for the "services rendered" to the corporate plutocracy. And all this is supposed to be the pinnacle of democracy. Isn't Donna Cadman now the Conservative candidate in Surrey North? I'll bet that by the end of the week, we will be using the past tense when referring to her as a Conservative candidate. The guy who wrote the book about Cadman was just in CTV a few moments ago defending the story, and says there was one other person in the office with Cadman when the offer was made. The 'other guy' wasn't identified in the CTV news clip. Isn't bribing someone for support for a Commons vote a criminal act? This is a little more blatant- I see it as worse than a bribe to step aside. If someone steps aside voters get a choice but if someone is bought they remain there--. The fact that it is for specific purpose is also a problem- we all know that the electoral system is not fair but MPs are supposed to be beyond purchase once elected. Otherwise why not auction your vote on ebay? Read the articles linked above and you'll see who the 'other guy' was [Cadman's CA]. Also the quotes from Harper that the author got certainly show he was aware this was happening- and don't look good- but there isn't anything that would legally be construed as bribery. If this offer was made, it's hard to believe that any insurance company would sell a million-dollar life insurance policy to a man dying of cancer! This would include buying a vote - but I guess it arguably might not include stepping aside, based on the wording. Any criminal lawyers out there (sorry, I know that's a redundant phrase)? On whether it would be formally/legally bribery as far as the criminal code goes... it is interesting where the $1 million was suppossed to come from. From various people's words, it seems there were definitley documents drawn up for Cadman to sign. IE, if you are going to get a so called insurance policy, you have to sign for it even if you pay nothing for it. I wouldn't think there is an insurer on the planet who would write a policy for a dying man. And if they existed- the 'premium' would be over 95% of the expected payout. So who was putting up this money? Even if there can't be a criminal investigation, it may turn out that people can be pressured to talk to save their own asses, much as is the case when a criminal investigation is either going or possible. While I'm not so sure Donna Cadman is soon to be the ex-candidate- but some fallout is pretty certain. They wouldn't dare turf her no matter what she says- and the Cadmans don't seem the back down type. She may quit in disgust to new things that come out- but what we have heard so far she already knew. ...but there isn't anything that would legally be construed as bribery. Whether it's fact or expost factum story concoction does not matter: they claimed at the time to be worried that Cadman was voting to keep the Liberals in power because of financial implications should the government fall before he losses his life insurance benefits as an MP. So they were offering him a life insrance policy should that be his concern to keep it from influencig his vote. Transparent- but a long, long way from anything a prosecutor would have something substantial to work with. The government side in Question Period stuck to its stand, that Chuck Cadman himself said on national television "there was no deal". How, then to reconcile what his widow is saying to the contrary? Of course there was no deal. He turned them down when they offered him a deal. The paper trail of cash often disappears, as in the case of Mulroney and his nefarious activities, but these things are still very much worth investigating. Did you see the press conference called at noon by Mulroney's lawyer today? He was quite adamant that after three months of witnesses and contradictory testimony by Schreiber, that not one iota of evidence has been presented that can show any wrongdoing on Mulroney's part, whatsoever. He further stated this is all about Schreiber trying to buy time to stay in Canada and avoid extradiction, at the expense of the Canadian taxpayer. It'll be interesting to see what the Ethics Committee does after this huge provocation. Actually, I think Cadman's words were "there was no deal offered" or something on those lines. Peter Loan said that the two men simply offered to help him win his election (nomination?) campaign. ETA: Susan Bonner on CBC said earlier that the chairman of the Ethics Committee is supposed to reveal by end of the day today whether they will proceed with this or not. I don't follow. I know Harper is quoted as saying they were only offering Cadman what he might lose in an election, but, even if true, how does this make it legal? Is the victim's perceived (by the briber) need for the money considered a valid legal reason for attempted bribery? The wheeling and dealing was common knowledge at that time. Bribery. But since the perpetrators are the rulers themselves, it lost its criminal nature and became just part of the "political process". Anne Dawson, with files from Allan Woods. Although Tuesday's defection of former star Conservative MP Belinda Stronach to the Liberals helps shore up numbers for the Liberals, efforts to lure more Conservatives to cross the floor are continuing. PMO spokesman Scott Reid, earlier in the day, rejected reports there have been any offers, other than the one Stronach accepted, made to MPs to entice them to change their vote today. However, a senior Liberal official said two Tory MPs approached the Liberals in the past 48 hours offering their votes for appointments. "We said no," said the official. The fate of tonight's vote and the future of the government appears to rest with Independent MP Chuck Cadman. The B.C. member of Parliament, who is suffering from cancer, but will attend the vote, has strongly hinted he will side with the Liberals because a poll of his riding constituents revealed they do not want an election. The poll of 600 eligible voters in his Vancouver-area riding indicated two-thirds of respondents did not want an election now or in the foreseeable future. Stupid question but how can the Ethics committee investigate when the party making accusations is the late Chuck Cadman. I am not saying it happened or did not happen but to get the "truth" you need to be able to talk about it. It will be a one sided conversation. CBC's Paul Hunter justgave an update - a decision won't be made until next week. Nope - the Liberals and the NDP are making the accusations based on the contents of the book, and by Cadman's widow confirming that something was offered. Again, nope. The Conservatives are saying one thing, the author of the book, and Cadman's widow, something different. An inquiry is needed to get to the truth. Why are we talking about "inquiries" and "Ethics Committee"? If the allegations are correct, it's at least a potential violation of the Criminal Code. If he had a policy that would be terminated by having an election equal or more than what was offered then he really was not being offered a bribe because he would not have had an economic benefit from voting that way-- they were simply removing the disincentive or cost from one of the choices. That was a special case- since he knew that he would die in office if the government did not fall. This might explain why he would not have interpreted it as an inducement- he was offered nothing more than he would get if he voted the other way. In fact, you could argue that it is more ethical to have the offer than not because with the offer he would have no financial gain either way whereas without it he would lose $1,000,000, or whatever it was, by voting one way and preserve it by voting the other. I would want an MP to vote on conscience not forced by personal economics such as this. This may raise another issue since it could happen again. If by quiting or forcing an election an MP who has become ill while in office would lose their insurance, they may be forced to keep a government in power they do not support. (Come to think of it Dion is looking kinda pale these days.) The only way to take this out of the mix would be to negotiate an agreement that MPs have their employer life insurance policies continue for 36 months after they leave office. This would not be a very costly way to take off the table a horrible and morbid yet very real conflict of interest. This is the first I am hearing of it but I would be surprised if it never figured before on such a vote. In this case, if the Conservatives were only matching or preserving a benefit he would lose by voting one way and retain by voting another way then I don't have as much of a problem with the offer and I understand the purpose. My problem then would be the secrecy- they could have called for a vote for the country to pay the money rather than a party. Possibly all parties would have seen fit to agree. Or they could have asked all parties to pay it and then put something in place to make sure that this conflict does not come up again. I have more of a moral problem with an MP having a cost of a huge sum of money to vote a certain way than someone taking that cost off the table- if that is all they did. Things are different-- now we have a Conservative government, how would you like it to survive because someone in the house is worried about losing their life insurance? As distasteful as it was this means that Cadman's support of the government came with the knowledge he could have voted the other way without damaging his family's financial well-being. Isn't that good to know? Would you not be more upset if the Liberal government survived because he could not afford personally to bring them down? Maybe his wife is making this public to make sure nobody thinks he voted the way he did for economic gain for her. I think people have been cautious here so far but I would like to remind everyone that due to the reputations at stake, and that some are not public people, comments in this thread should be written carefully so as to avoid unwarranted harm to a person and/or legal exposure to liability by this board and the individual posting. Sean, after saying all that - if (hypothetically) the Conservatives secretly approached Cadman and offered him an insurance policy (which is undeniably a "valuable consideration") in exchange for his vote - how would that not fit exactly within Section 119(a) of the Criminal Code? A bribe would mean that in exchange for voting a certain way he would recieve a benefit that he would not recieve by voting the other way. -- and therefore this would introduce a consideration other than conscience into how he would vote. In this case it is sounding like he might have had the same economic situation either way. I am not sure how a court or inquiry would sort that out but it seems that the Conservatives resolved rather than introduced a conflict of interest. I am not sure that this could be called either a bribe or a crime. However, if the benefit they offered was worth even 1 cent more than he would have had by voting the other way then this would appear to be another issue. As much as I am no fan of the Conservatives, I am taking the same opinion no matter which party was invovled. The issue here may be the secrecy and that is an ethical but probably not a criminal issue-- at least that is my reading of this conditional on the assumption that what they offered was less or equal to what he would have had anyway if he voted the opposite way. Well, I don't think the law cares whether he was being offered a "net" benefit or not. According to your logic, if the Liberals offered him a $1 million policy for voting for them, and the Cons offered him the same for voting for them, no one would be guilty of a crime - right? Arguably in your scenario the one who first offered the bribe would be guilty of a crime, as they would have offered benefit in exchange for a vote- the second is less clear and quite unimaginable as in this situation the second would simply report what the first did rather than match it. I see things simply. If I say, "vote my way and I'll give you $1.00", it's a crime - as surely if I offer a judge $1.00 to rule in my favour. A benefit for a behaviour must be offered for it to be a crime. matching the other behaviour is absorbing a cost not providing a benefit. There is a difference. The simple way is did they make an offer to give him a financial gain for voting the way they wanted- profit. The criminal code is clear there has to be a benefit in the behaviour being induced. If the other possible behaviour would result in the same thing then it is not a bribe. A little unsavoury perhaps but so is having a dying guy have to consider that if he votes one way he loses his insurance and if he votes the other way his family gains $1,000,000. A little unsavoury? Do this and we will provide a million dollars to your family? Criminal, I would say....no ifs ands or buts. I have to admit for every ten pegs that the Harperites fall on this, Cadman wins more respect. An honest person, imagine! So why is his widow planning to run as a candidate for the party that tried to bribe her dying husband? Running as an independent is not going to give me the leverage that I need to make changes. That is a side issue. The key here is there was an attempt to bribe. Criminal and it should be investigated. At least until we get a legal opinion otherwise I stick with the assessment that there isn't anything here a prosecutor would want to take on. In a couurt- and we're talking only in a court here- it is way too easy for prospective defendants to simply say that they only wanted to remove Cadman's disincentives to vote against. The fact that is a monetary inducement is not sufficent to make it a bribe. And not by a long shot in my opinion. But as to the substance of what happened- I agree with unionist, and Sean is being way too charitable. The quote from Harper has the unmistakable aura of a story cooked up to have plausible deniability. Harper said, I told them it wouldn't work, but they were convinced that it was really a matter of Cadman being worried about his family's future. It's a cover story. And in my opinion sufficient to keep them away from risk of prosecution. But it's worse than that. Chuck Cadman's MP's life insurance benefit would not stop the day the government falls. I don't know how long, but it would go on for quite a while- and everyone involved would know that. It's pretty blatant- they were offering him a million dollars for his family. Period. And I can't see how plausible deniability is goig to help Harper in the court of public opinion. "Explanations" only make matters worse in this kind of affair. So far they are saying it just didn't happen. It'll take a while for everyone to know the gist of what is in the book. Harper's words alone are bad enough. So in the days ahead we'll begin to hear the to and fro about who is to be believed. And it sure sounds to me like there are too many corraborations to the authors accounts- even from Harper... which you'll note they have not tried to deny. Of course if it was criminal it ought to be investigated. But if the issue is not criminal and I have expressed why it might not be, there would still be some ethical issues with the way the offer was made and the secrecy surrounding it. I do not think that this is so simple as to come down to whether or not it was criminal and I also do not think that this is a simple question. For this reason it would be quite wrong to give this to a behind-closed-doors police investigation which very likely will clear the Conservatives of criminal charges without looking into the ethical issues and accountibility issues that to me are much clearer. It may be that the Conservatives might prefer a criminal investigation that probably will clear them to a public ethics investigation that will ask uncomfortable questions about their ethics -- during a time they were slamming the Liberals for ethical breaches and promising open government. To bring this into a criminal debate that only shuts out public discussion and likely won't convict may not serve the public well. I would prefer to see an open inquiry that would only become a criminal one IF there is evidence to support that. The first question needs to be an interpretation of whether an offer to match what he would have had if he voted the opposite way is in fact a bribe or is criminal. The second question needs to be did they offer more than what he would have had if he had voted the other way -- if the answer is yes to either of the first two questions then we should move to a criminal investigation, if the answer is no to both, then a public examination of the ethics of the proposal should proceed. Politically, we need to ask how this squares with the promises to have an open an ethical alternative to the Liberals and what could have been done to remove the conflict of interest in an open and ethical manner. This would be better than a failed criminal complaint that clears the Conservatives of criminal wrongdoing while leaves all the ethical questions unanswered and undebated. As to the question of whether Cadman's insurance stopped or not the day the house would fall is a good question to ask. The second there is any evidence that he would have had a greater benefit from the Conservatives offer by voting their way rather than the government's then this thing should go criminal-- in the meantime haul out the bright lights and the magnifying glass and keep this public. There are a lot of good questions besides the criminal one starting with why this was brought to the public record now rather than at the time. By the way-- I think I am being more cautious than charitable. This is part of the secrecy issue-- if the Conservatives had gone public at the time saying they would be prepared to match what Cadman was losing and no more, I likely would have had no trouble with it. Possibly Cadman might have been able to take that offer. Instead, they came skulking around offering a secret deal that would have made him dirty. As to the question of whether Cadman's insurance stopped or not the day the house would fall is a good question to ask. The second there is any evidence that he would have had a greater benefit from the Conservatives offer by voting their way rather than the government's then this thing should go criminal-- in the meantime haul out the bright lights and the magnifying glass and keep this public. I know for a fact that an MPs benefits go on for a good while after they are out of office. I just don't know how long this benefit would stretch. but w're talking at least months. Its a matter of public record. But it could never be construed that the benefit being offered would definitely overlap rather than replace what Cadman would get anyway. There are other reasons it wouldn't be known- but the fact no one knew when he would die is sufficient in itself to put people effectively beyond prosecution. Is Harper digging himself into a hole? During Question Period today, he said this question came up two and a half years ago, he looked into it, and saw there was nothing there. Should be interesting coverage of this on The National tonight. The Conservative government is corrupt and the RCMP is not better. Checkmate. During Question Period today, he said this question came up two and a half years ago, he looked into it, and saw there was nothing there. So far I've only heard this account of QP today second hand. If this is what he indeed said today, it does not square with what he said at the time in the interview transcript. The interview describes it as something he knew about as it developed- not something he needed to 'look into' later. Not that it is a direct contradiction or he can't chalk it up to the passage of time. But it indicates they are having difficulty coming up with a story that is both consistent and will shed water. Due disclosure: I never thought they would get away with being tagged by their Adscam affair. But this affair offers only a small fraction of complexities for them to hide behind and obfuscate. I'm expecting that when pinned down- and he'll first drag out as long as possible getting there- Harper to next say that the interview transcripts are not accurate- and evade questions about how so exactly. Ken, I was watching QP live on CPAC - he indeed said close to what I wrote although the exact words might be different, but the meaning is the same. The CBC's Keith Boag reported that the Liberals have formally asked the RCMP to investigate this matter. I guess Dion is wishing he had had the intestinal fortitude to have forced an election- this would have been a good start to one. Dion wants an election (God knows why). It's the rest of his gang of losers that told him "not now". As I said, Harper Crew is going to make this move as slowly as they possibly can. They are sticking to the story that Cadman himself said there was nothing else offered- 'that should be good enough for all of you'. Its not actually a bad line of defense. It has a lot of credibility. But it will be sufficient for only so long. At a certain point they will have to address Donna Cadman and her daughter saying that Chuck Cadman explicitly told them otherwise. Because if they never address it, everybody else's statements become facts. The obvious fall back second line of defense would be that Chuck Cadman was mistaken. Problem with that is the tape of Harper directly contradicting that- that he knew and gave the green light to offering Cadman a financial compensation. Doesn't matter how innocently that can be packaged, that it didn't constitutue an attempt to bribe. Because going down that road at all demolishes the line of defense that Cadman was offered anything more than rejoining the party and an unopposed nomination. Then it becomes a much weaker defense of well he was offered something financial, but he was mistaken it was an insurance policy. Leaving aside even the problem that they would have to account for why the change of story... even this very weak defense becomes difficult because what Harper says in the interview is fully consistent with it being the offer of an insurance policy. So my guess is that in the PMO they are busy at work consrtruction alternative explanation of what kind of offer Harper is referring to in the interview. IE, they know that after stalling they will be going there, so they are working on the 'least unconvincing' alternative account possible. I can't imagine it can be convincing enough to not leave Harper with something that sticks- finally; but I've been wrong and sorely disspointed on that one at least once already. "But this time... you know, it looks so straightforward..."
In the same way as it would be criminal to offer someone a Cabinet Post in order to change their vote. These things go on all the time and attempts to get the authorities to pay the slightest attention don't go anywhere. 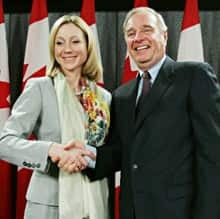 The daughter of Chuck Cadman has backed up her mother's story that the Conservatives offered the Independent MP a bribe of a million-dollar life insurance policy to vote against the Liberals in May 2005 and bring the government down. Cadman's daughter, Jodi Cadman, told CBC News that her father, a B.C. member of Parliament who was battling cancer at the time, discussed the offer with her and her mother because he couldn't talk about it publicly. Cadman died in July 2005. I agree that if the evidence presented so far bears out to be true, that the Cons offer to Cadman was criminal. But whether we can reasonably expect to see criminal prosecution is another matter. And not because 'they' won't go after the Cons or the Liberals [Paul Martin and Stronach]. Like libel, bribery is so difficult to prove, that it takes an unusually tight case to be legitimate enough to bring it forward. The RCMP may well investigate, but that in itself doesn't carry much weight. They say it's healthy to have a good laugh now and then. And the scurrying, rat-like Conservatives are entertaining as hell. Scandal looks good on Harper. But he should really get into his role and snivel a little more. It's so becoming. We should actually hope for the most perfunctory RCMP investigation possible- to minimize the amount of time Harper can stonewall behind "its a matter being investigated." Maybe the government should pull strings to get it picked up by prosecutors, so it can be "a matter before the courts" for a couple of years. I think there's a difference between the deal made with Stronach and the bribe offered to Cadman. As far as I'm concerned, offering Stronach a position in cabinet if she switches parties is basically like a job offer. "Here's the role we'd like you to play if you join our team." I don't have a problem with it at all. But what happened with Cadman sounds like out-and-out vote-buying. He wasn't offered a job or a role or anything. He was simply offered a million bucks for a Parliamentary vote. I agree. The former is morally iffy, and probably should be illegal, but the Cadman situation is out and out corruption, and is illegal. I'd say the RCMP should investigate the matter, but it's probably best turned over to a competent police force. I agree with Michelle too. I wouldn't quite say I don't have any problem with the Stronach situation, but that kind of thing is completely out in the open and eventually voters get their say (assuming the person does stand for re-election). The Cadman affair was not supposed to be out in the open, and Harper fully appreciated that fact. His initial reaction (taped) in 2005 upon being asked about a million dollar life insurance offer was "is this for publication?" Supposedly it is illegal to offer ANY inducement to an MP to get them to change their vote. This would include money or position - plus cabinet ministers get paid a lot more than backbench opposition MPs - so when you offer someone like Stronach or Emerson a cabinet position in exchange for switching parties you are effectively bribing them financially as well. If it was just a "job offer" then they wouldn't have asked her to switch before the vote, or talked relentlessly as they announced her cabinet post about how they could now avoid an election. If you take Harper at face value he's saying that Tories were worried Cadman would vote with the government because (and only because) he was worried about losing his job - so they discussed the matter with him to see if they could put his financial worries to rest. It's b.s. but if Paul Martin can buy Belinda Stronach's vote and call it a "job offer" then Stephen Harper can attempt to buy Chuck Cadman's vote and call it "a retirement package". KenS is right: this stuff is hard to prove. But he's also wrong: "they" (ie. the authorities who are supposed to enforce the nominal rules of Parliament) never even try. I've always thought Cadman was a rare principled politician. But now I'm starting to wonder. Why didn't Cadman make this public after the vote? This could have saved everyone alot of pain by ending Mr. Harper's reign. If Cadman turned down a million dollar life insurance what did he get from the Liberals? Both parties have a history of offering "enticements". Why is his wife dragging this out now? Is she getting a cut from the book sales? Has anyone tried to get a life insurance quote for a terminally ill person? How does Dion feel about selling books (ie: Like a Rock: The Chuck Cadman Story)? Did you catch that Paul Martin wrote the introduction. Maybe it could replace the Liberal's old red book of broken promises since . But he's also wrong: "they" (ie. the authorities who are supposed to enforce the nominal rules of Parliament) never even try. The enforcers of the rules are civil servants and this is well beyond their prerogative. Pursuing the case is up to the police and prosecutors. The government through ministers can request them to puruse it [which no one expects], and we are not so naive as to assume that going against the political bosses [and which ones] is of no concern to police and prosecutors. But the choice is theirs' in the end. And in all potential bribery cases- including this one- there are plenty of practical reasons besides influence drive ones for prosecutors to decline to pursue, and for police to investigate only the obvious. And as I pointed out, their are lots of political reasons to want this to stay entirely within the court of public opinion [which includes the House Ethics Committee].... with criminal prosecution only bandied about for its rhetorical value. Important rhetorical value, but not to be taken seriously in its own right. Prosecution is not going to happen. Focus on the court that matters. Lots of reasons for Cadman to not want to talk about it. He was dying soon and very tired. He was rightfully proud of his moment in the spotlight. Why mess with that? It's dirty stuff. These are people he knew. Who wants to deal with stuff like that when you have bigger issues? As for Donna Cadman- not as dramatic, but similar. That stuff happened in a very powerful time of her life. All things considered, even the political stuff alone, let alone the real life and death issues... this wasn't such a huge deal when it happened. And it's dirty. They don't have your cynicism about politics. Most people want to trust someone they are dealing with... so they make allowances. And so it goes... without a gram of personal corruption entering into the picture. Even the BQ got in on the action in QP this morning - asked I think six questions about the Cadman bribe. Yesterday, the Cons answered I think every question on this matter in English because they desperately wanted to keep this out of the Quebec press. Good for the BQ to ask questions on this in their language, sure to stir things up in Quebec! The BQ getting in on the act and asking embarrassing questions at a time when Gomery is still fresh in our minds... could this be the beginning of the decline of Conservative support in Quebec? Who wants to start the "Dona Cadman as Conservative candidate for Surrey North" death watch. I predict she will resign by early next week. Oh, I hope Dona Cadman stays the course, until the Cons decide they have no choice but to boot her out of caucus! That would be delicious - and the end of Conservative representation in that riding forever! Cadman would sweep that riding, hopefully, if she was forced to run as an Independent. This story just keeps getting better and better. Anyone see the exchange between James Moore and Garth Turner in QP this morning? Surrey North is currently held by the NDP. I don't want Dona Cadman to win period! But there is no way that she would be allowed to run as a Tory after saying that harper is guilty of bribery. I'm saying that if Dona Cadman is turfed out of the Conservative nomination, the Cons will never, ever have representation in that riding again. Have you noticed that Harper is still saying that Dona Cadman is the Conservative candidate for Surrey North despite her claims? I don't think the Conservatives have any chance in Surrey North in any case. Its one of the poorest ridings in all of BC. If it were in Toronto it would be like York West or Etobicoke North. It went NDP by a very wide margin last time. The two provincial seats that are in it went NDP by whopping 2-1 margins last time. Penny Priddy was on camera yesterday saying she and Done Cadman are good friends, so it must have come as a surprise to her to see Dona Cadman running to replace her. When did Dona Cadman decide to run, anyone know? By the way, from the media coverage I've seen so far, Dona Cadman's story is the more believable - if she is fact correct in her assertion, should Harper apologise? Resign? It gets even weirder. In the 2006 election Dona Cadman endorsed Penny Priddy! Now the newspapers have Cadman's daughter weighing in who backs up her mothers story, but also says that she is opposed to her mother running as a Tory and that she still likes Priddy!! Nothing like a political soap opera to keep us rivited to the news! When did Dona Cadman decide to run, anyone know? Scroll up up up, Boom Boom. July 12, 2006. I agree the Liberals look like a bunch of hyenas over this story, but the NDP and BQ are also chiming in, although not quite as hysterically, thank goodness. By the way, the NDP's Pat Martin asked the RCMP to investigate this matter, it's not just the Liberals who asked. ETA: the Liberals saw the book in progress a year ago and said nothing? Holy crap! That seems normal to me. Just kidding, Paul Martin's libel lawyers!! Dig Cadman up. I bet there is an insurance policy stuff in his inside jacket pocket. Was it only Martin who saw the book? The author might have given him an advanced copy so he could write the foreword on the condition that he not talk about what was in it until it was published. Something like an embargo that happens in news rooms. But if he saw something that could be illegal, you'd think he'd have an obligation to break his word and go to the cops. maybe Martin didn't read it first before he wrote the foreword! like he didn't read the lines containing the sponsorship money allocations in the budgets he wrote. Cadman's daughter was quoted in Vancouver as saying she wished this had not come out but in fact before he died her father told her about this meeting and his version was the same. Do really think it was Martin wrote the forward? Despite the brevity of his tenure, the guy IS a former prime minister. (He's also keeping busy building his Prime Ministerial Golf Course as reported by the Globe in November). The manuscript would have been passed off to Jim Pimblett or another Liberal lackey to review to make sure it was fit for the old man to endorse. So Liberals had knowledge of this "scandal" for an entire year and did nothing with it ... until the moment they are being hoisted upon their petard for surrendering to Harper's agenda, again. Convenient. Stockholm: I don't think the Conservatives have any chance in Surrey North in any case.... It went NDP by a very wide margin last time. The two provincial seats that are in it went NDP by whopping 2-1 margins last time. The federal riding HAS gone to Conservative and/or Reform candidates in the past. It seems to depend very much on the strength of the candidate or some other factor (e.g., Chuck Cadman won as an independent when his party, the Conservatives, nominated someone else despite Cadman being the incumbent M.P.) in this riding. It's even possibble that Donna Cadman will have the support of some Conservatives despite the issue in this thread, as they will support an "independent" over an NDPer. I wouldn't be so cocky if I were you. Before this whole thing, I would have called the riding Conservative. Penny Pridy won last year largely because of Dona Cadman's endorsement. Before then, the riding went Alliance and Reform by wide margins. Even in 1988, the PCs nearly won the riding. The riding will go Conservative if Dona runs as the party's candidate. If the Conservatives drop her (my will THAT ever go bad) and she runs as an Independent or Liberal, then it could break any one of three ways. If the Conservatives drop her and she decides not to run, the riding will go NDP. In any case, this looks bad for Harper. This one will probably stick to him. She also said that her father did not want it to become public because it could not be proven. I find it ironic that Cadman gave two public interviews after the vote and LIED when he said he was offered nothing. I bet as more and more facts come out the Liberals and Conservatives will look worse and worse. I too wondered how getting a life insurance policy in the name of a dying man was possible. I'm not familiar with insurance policies and the industry though. Anyone? I too wondered how getting a life insurance policy in the name of a dying man was possible. I can't think that an insurance company that offered large policies on terminally ill people would last too long. How would the premiums paid on average exceed the value of the policies? This riding has changed boundaries dramatically since the 80s and the current riding of Surrey North is very homogeneously poor, run-down, working class and also has a vast Indo-Canadian population. It only ever went Reform in the 90s when NDP support in BC was in the low teens and when Reform had a populist streak that (to put it mildly) the Harper-led Tories do not have. While it didn't hurt Penny Priddy to have Dona Cadman's endorsement, she would have won no matter what. Dona Cadman is NOT her husband and given that we won't even have an election for quite a while and her very weird confused ravings on this matter, its hard to see her getting much support. I think the chances of Dona Cadman running as a Tory are just about NIL. How do you run under the leadership of a man you are now accusing of being guilty of bribery. He not busy being born is busy dying - Bob Dylan. On Newman's show tonight, someone said a new tape has surfaced today from a radio station in Vancouver where Chuck Cadman is saying clearly he was made an offer. Apparently Paul Martin has had an advance copy of the book for months. Now the NDp is calling for an investigation of why Paul Martin was aware of a law being broken and yet kept what he knew under wraps! Why do I feel this is some sort of PC plot whereby the Libs freak and then it comes out that the reason Chuck turned down the tory offer is because he accepted the lib offer which was more like a real bribe. That part of your scenario has already come true. So does Harper, actually - did you see him in QP yesterday? Hang 'em all and hang 'em high! If not, maybe Conrad has a bunk to lease, eh. ...to think Joe Who lost favour because his carbon tax was ahead of his time? What a bunch of unsavoury miscreants.